Nothing lasts forever, and unfortunately for our power generation customer near Dallas, Texas, that includes wind turbines. When a wind turbine has a catastrophic event, it can raise the question: was the tower damaged? Sometimes tower damage is obvious, but other times there can be very subtle dents, twists or bends that are not obvious to the naked eye. This is where 3D laser scanning comes in. From a safe distance, the 3D scanner can capture the geometry of the tower into an accurate point cloud. The point cloud can be compared to ideal tower geometry. Using deviation images, it is readily apparent whether the tower has been bent or dented. 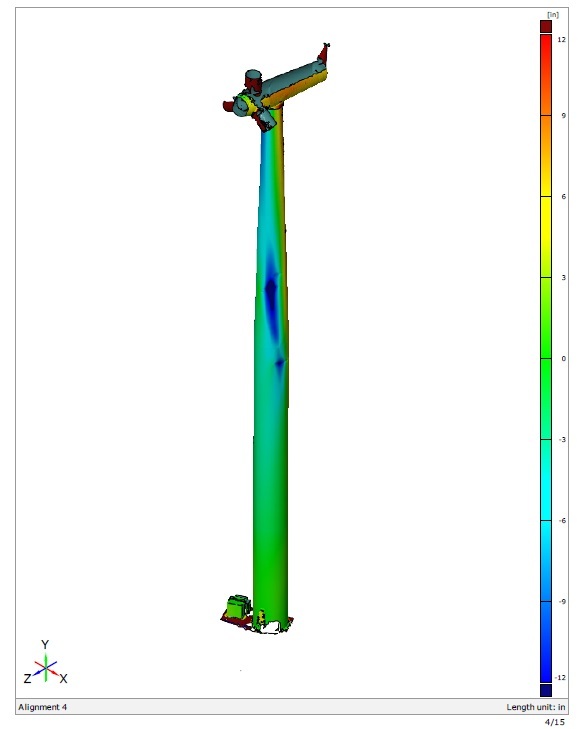 Our 3D modelers are also able to create a solid model of the “as-dented” tower so that engineers can use structural analysis software to determine if the tower is safe to use.